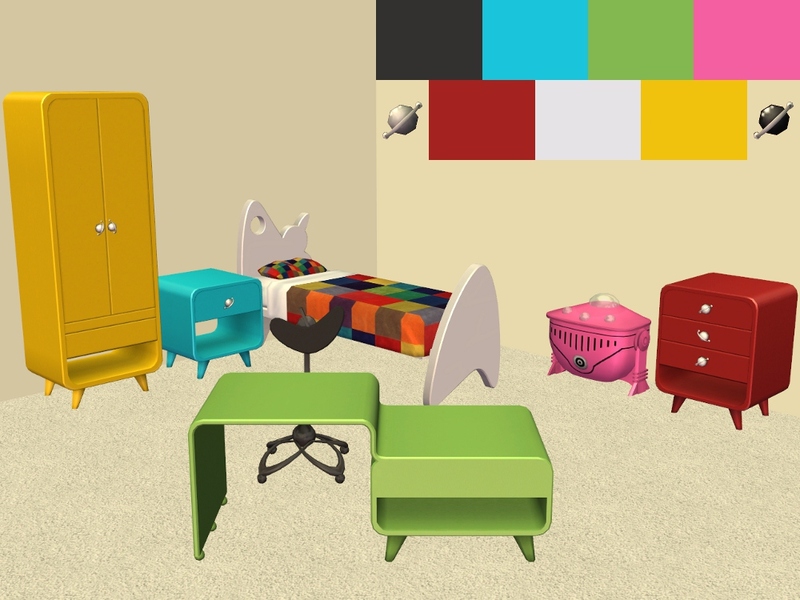 PETS - SpaceKid Sims Sonic Sleeper, SpaceKid Sim’s Atomic Armoire, Little Space Rangers Chair, Junior Cosmonauts Bedside Table, Atomotoybot by Galactico, Andromeda Li'l Astronaut Desk & Andromeda Far Out Dresser in LACK colours. Each comes with both Black and White handles, the base colours are with the black handle recolours. If you don't want the black handles it's as easy as opening SimPE and changing the "panel" TXTR's over. 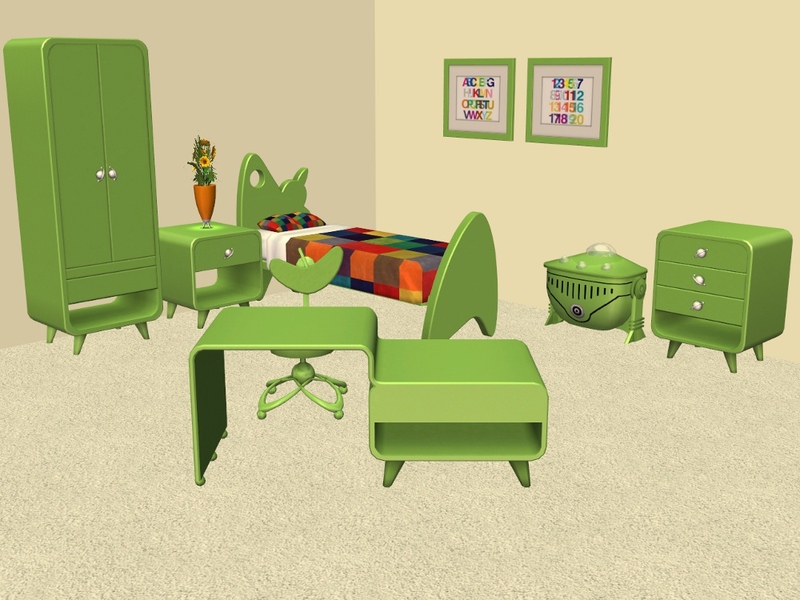 SpaceKid Sims Sonic Sleeper - Found: Buy Mode > Comfort > Beds Price: §500. Andromeda Far Out Dresser - Found: Buy Mode > Miscellaneous > Dressers Price: §485. 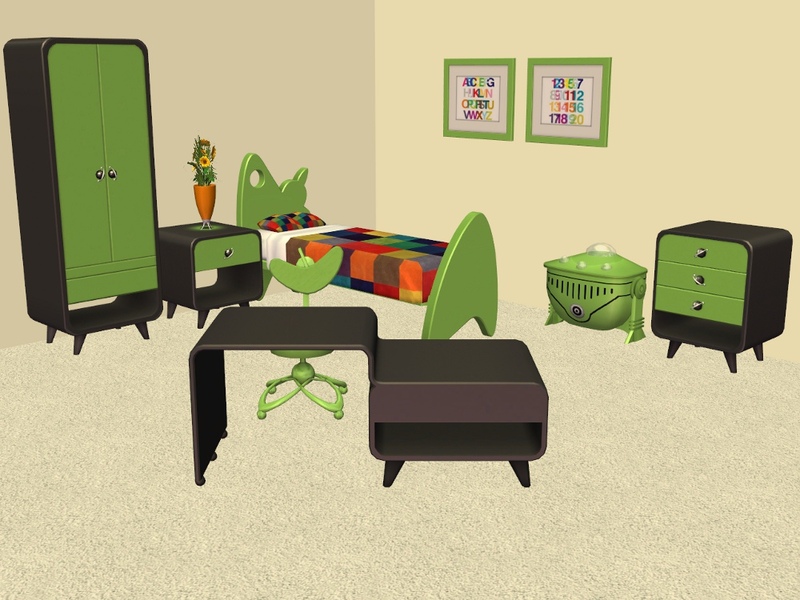 SpaceKid Sim’s Atomic Armoire - Found: Buy Mode > > Dressers Price: §850. Atomotoybot by Galactico - Found: Buy Mode > Miscellaneous > Children Price: §55. Little Space Rangers Chair - Found: Buy Mode > Comfort > Dining Chairs Price: §175. Junior Cosmonauts Bedside Table - Found: Buy Mode > Surfaces > End Tables Price: §115. Andromeda Li'l Astronaut Desk - Found: Buy Mode > Surfaces > Desks Price: §550. Custom Content used in my screenshots: 'Transcendence' Frame - LACK Recolors by Klaartje, prints, plant & bedding by me not available. All files have been compressed and checked in game. Colour chart is included in the zip file. If anyone would like different colours just let me know please. I also have my templates, shadows and overlays if anyone would like to use them. Sorry, I don't know how to do layers so they are all separate. Ooh. This looks fantastic, Michelle. Thank you! Looks great! Aren't you quick Thank you for sharing.